The payphone. Despite how connected our world has gotten in the last decade or so, the majority of the 11,000 payphones in NYC stem from a 1999 contract. Due to expire and renew in October 2014, the city's Department of Information Technology and Telecommunications (DoITT) has been actively figuring out how and what type of modern solution it wants to replace roughly all 11,000 of them with. You've heard about a small number being retrofitted with WiFi hotspots and SmartScreen information portals, but those have essentially been tests. Last night at Quirky's offices, the city picked out finalists for five categories that could possibly help "Reinvent Payphones" here in the Big Apple: "connectivity, creativity, visual design, functionality and community impact." Well over 120 entries were submitted since this design challenge kicked off last December at the NY Tech Meetup, with a total of 11 semifinalists having gotten the chance to present their ideas last night for judging. As it turns out, there was a tie for community impact, leaving six finalists overall. Better yet, out of those six, the public can take to Facebook from now until March 14th to select a "popular vote" winner. Curious for more insight? We got to chat with the city's Director of External Affairs at the Department of Information, Nicholas Sbordone, about the project and he talked about how it went down and what it means for the future of payphones in NYC. Unlike the Taxi of Tomorrow, there isn't exactly a winner coming from this event that'll provide a final design. As Mr. Sbordone explained to us, this whole competition mainly helps the city get insight from those outside of the telecommunication industry. One such avenue of ideas came from when the city initially sent out an RFI (request for info) back in July to coincide with the announcement of retrofitting WiFi hotspots to select payphones -- respondents included the likes of community boards and current franchise owners. He noted that "as [the] w works to determine the overall future of the public pay telephone, [it's] facilitating a number of pilot programs (at no taxpayer cost) which use existing payphone infrastructure to gauge public interest and feedback in the services offered." Overall, the city is trying to get input from as many avenues as possible. As Sbordone puts it, "[the city]'ll take the results of all the ongoing efforts above, plus the best ideas from the Reinvent Payphones Design Challenge winners and then bake all of it into the City's formal solicitation (known as a Request for Proposals, or 'RFP') for the future of the payphone. We'll look to issue that RFP later this year." The point is, all of these together is what'll help shape the guidelines for what the city wants in its payphone kiosks come October 2014. Background aside and, getting back to the event, each of the 11 semifinalists got a chance to show off their conceptual ideas, which served as their key presentation to the city. Sbordone explained to us that those awarded with a certificate for any of the categories reflect what the city sees as the most promising ideas, but that it doesn't necessarily mean they'll play a bigger role in shaping the final spec requirements. So onto the five finalists. The acclaimed folks from Frog Design won the visual design category with Beacon. One of our favorites of the bunch -- the 12-foot tall structure would, at street level, featuring a gesture and voice controlled LED screen, and some physical buttons for the likes of catching a cab or calling emergency services. Living up to its name, the upper portion provides light to the sidewalk down below, while also serving up advertisement space. Better yet, a solar-charged battery backup keeps it running if the power goes out. The connectivity category got snatched up by a concept project dubbed NYfi. The stainless steel structure would serve up a smartphone-like UI on its touchscreen -- like a phone loaded with information and traveling apps. Along its sides, replaceable modules would be able to serve up Metrocards and parking cards, while an array of programmable LED lights on its top could be used to display various information symbols. As as an added bonus, the base of the unit would also serve as a conduit box for the city's electrical and communications workers. NYfi and Beacon seem like ideas that would fit right on the street as is, but the creativity category went to FXFOWLE's NYC Loop, thanks to its slightly adaptable and open design approach. Looking like a walk-though telephone booth in stature, the unit could project ads that bleed onto the sidewalk on one side, while leaving space for the likes of greenery to be affixed on the other side with a spot for a seat to top it off. Standing inside would give users access to a touchscreen information / phone interface, with a built-in sound wall for some isolation from the busy streets. The edges of the units would also allow pedestrians to plug-in and recharge their devices. That tie for community impact we spoke about earlier highlights two of of the most unusual approaches of the bunch. NYC I/O's Responsive City with a Minority Report-style of interaction and Windchimes' Arduino-packing payphone / environment monitor had the judges split. The minimalistic approach to Windchimes is a nice change of pace to the giant smartphone-type designs from many of the demos. While it appears like it would be right at home in a treehouse, we won't be shocked if weather-sensors appear in the city's future payphones. Plus, we're digging the nostalgia of the physical number buttons in this world of touchscreens and control gestures. Lastly, Smart Sidewalk took home the certificate for functionality -- and we can't disagree. Serving the simi The svelte kiosk would get placed on the curb, with the ground below it serving to handle and filter runoff water from the street. Two solar panels provide it with energy no matter where the sun is facing. Gesture controls would be incorporated and users would be able to adjust the height of the Windows Phone-esque UI on its touchscreen, while a braille keyboard would be included below it. As you'd expect, the interface would allow you to get local info and maps, browse the web and more apps would be able to get added for additional functionality. Living up to its name, a strip of LEDS would be placed across the sidewalk at its position to provide various types of location information to anyone walking by (sort of like those end zone markers on you see when watching football on your TV). The sides would allow for the likes of USB charging, WiFi connectivity and credit card swiping, and seemed to be a norm for many of the demos. If you want to cast a vote for your favorite idea, you'll have until 5:00PM ET on March 14th to make your digital voice heard at NYC.gov's Facebook page linked below -- this is also where you can get the full details about each of the finalists' projects. The winner will be announced the next day -- and who knows, one of these concepts might end up being somewhat of a reality in late 2014. For more info on the judges involved, all 11 semifinalists that presented and the initiative as a while, check out the press releases below. Mayor Michael R. Bloomberg, Chief Information and Innovation Officer Rahul N. Merchant and Chief Digital Officer Rachel Haot announced the winning prototypes from the Reinvent Payphones Design Challenge, a competition that engaged hundreds of urban designers, planners, technologists and policy experts to create physical and virtual prototypes that imagine the future of the City's approximately 11,000 public pay telephones. The City received more than 125 submissions aimed at modernizing payphone infrastructure and optimizing the use of public space. Competition judges selected 11 semi-finalists to demo their prototypes and the top submissions were awarded for best connectivity, creativity, visual design, functionality, and community impact. The Reinvent Payphones Demo Day occurred last night at Quirky, a social product development company that brings new product ideas to life through its online collaborative platform. Eleven semi-finalists presented their prototype ideas to a panel of judges including Ben Kaufman, founder and CEO of Quirky.com; Andrew McLaughlin, entrepreneur in residence at Betaworks; Majora Carter, founder of Startup Box; Jason Goodman, CEO and co-founder of 3rd Ward; Nancy Lublin, CEO of DoSomething.org; and former United States Deputy Chief Technology Officer Beth Noveck. "New York is the most dynamic city in the world, and while technology has changed all around us, the city's payphones have remained mostly the same for decades," said Mayor Bloomberg. "That's why our Administration launched interactive touchscreens around Union Square and free public Wi-Fi at payphone locations across the five boroughs. 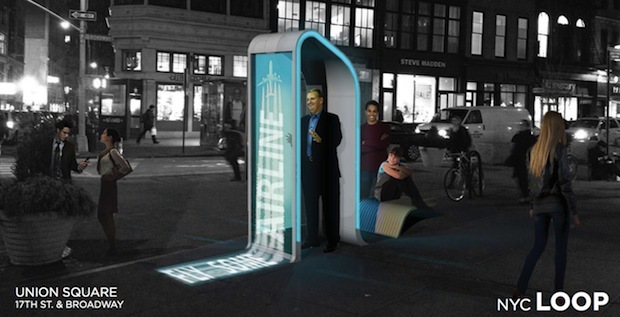 The Reinvent Payphones Design Challenge has resulted in some of the most creative and dynamic ideas to date – with the potential to transform the aesthetics and functionality of New York City payphones." "New York City's public pay telephone network has incredible potential," said Chief Information and Innovation Officer Merchant. "By collaborating with the City's vibrant technology community to develop creative and forward-thinking ideas, this infrastructure could become one of our most important technological assets, helping define the 21st Century streetscape in cities around the world." "The goal of the Reinvent Payphones Design Challenge is to collaboratively engage designers, urban planners and technologists in imagining an innovative future for the City's public communications infrastructure, and we have been humbled by the phenomenal talent and creativity of the initiative's participants," said Chief Digital Officer Haot. "With more than 125 outstanding submissions, 11 semifinalists, and six winners, Reinvent Payphones exceeded our expectations and marks another step forward in Mayor Bloomberg's roadmap to make New York the world's leading digital city. From Wi-Fi hotspots and charging stations to alternative energy sources and community art installations, once again New York City proves to be fertile ground for launching groundbreaking ideas that set the global standard." "We were blown away by the thought and design that went in to these submissions," said Ben Kaufman, Founder and CEO of Quirky. "The Reinvent Payphones Design Challenge furthers the notion that great ideas can come from anywhere. Even better is that these ideas were developed for New York, but could inspire cities around the world." Connectivity: Ability to connect New Yorkers and enable communication, including for safety and emergency purposes. Creativity: Originality, innovation, and quality of idea. Functionality: Flexibility, versatility, scalability, accessibility, and sustainability. A sixth prize category, "Popular Choice," will be decided by public vote through the City of New York's Facebook Page at http://on.nyc.gov/votepayphones. Voting begins today and will run through 5:00 PM on Thursday, March 14, with the winner announced on Friday, March 15. 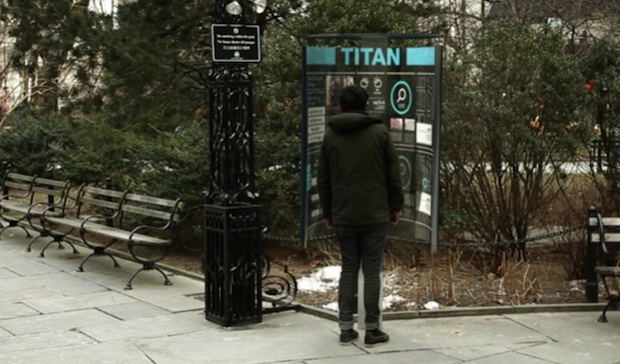 "Reinventing the payphone is not only about a sleeker design or a digital display, it is about radically reimagining a public amenity; how it will be used, and what it will provide," said the NYfi team. 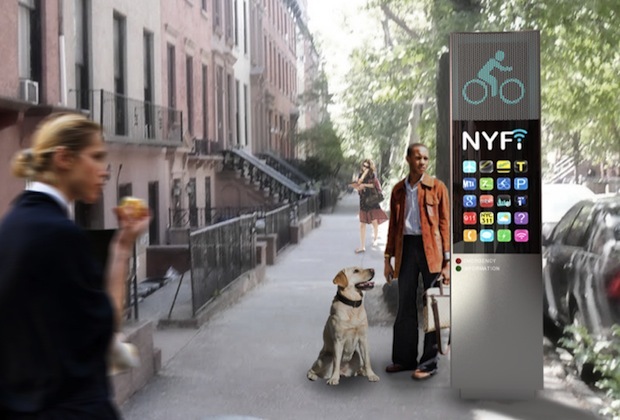 "Unlike today's payphone, the NYfi will be an interactive portal to public information, goods, and services, a hub for free wireless internet access, and an open infrastructure for future applications. Two versions of the NYfi are proposed: a 10-foot model for commercial and manufacturing districts, and a smaller model – with limited functionality beyond Wi-Fi and emergency services – for residential and historic districts where new payphones have not traditionally been permitted." 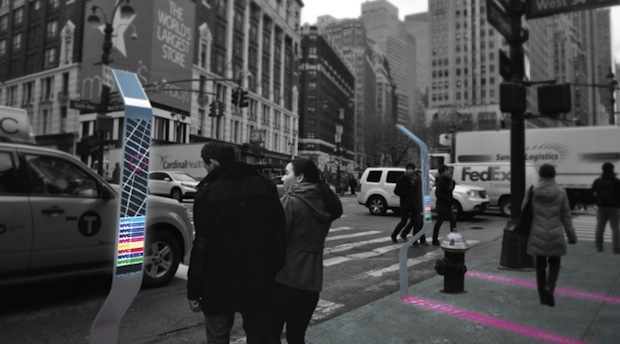 "NYC Loop combines a beautiful, contemporary payphone with a uniquely tailored public space that can be chosen to suit New York's diverse communities," said the NYC LOOP team. "It provides sound harmonizing technology as well as a smart screen for making calls and enhancing personal mobile communication. The Loop also features a responsive projector that creates an 'information puddle' on the sidewalk with which any passerby can interact-an amazing opportunity for local artists or as a means of generating revenue from advertising space. The iconic design of NYC Loop and the relationship of its public space units to the city's neighborhoods will become an integral part of New York City's urban identity." "BEACON is New York City's next generation open communications platform, connecting the city and its services with our communities, businesses, residents, and visitors," said the Beacon team. 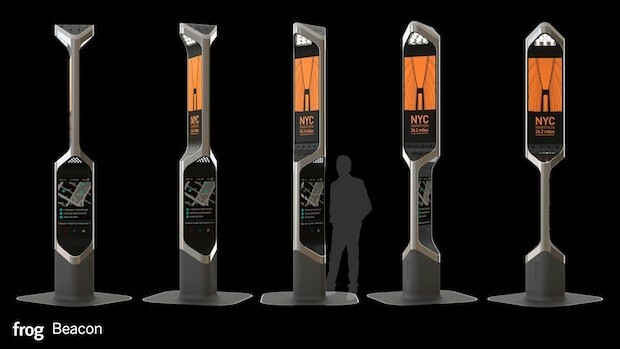 "Our submission, the 'NYC I/O: Responsive City,' updates the payphone with a modern array of sensors and displays to create a foundational input/output system for an open, urban-scale computing platform, which would allow New York City to respond to and serve the people in a way never done before,"Through open access to real-time data and a distribution platform for community, civic, arts, and commercial apps and messaging, we can create a safer, more efficient, and more enjoyable city." "We are a group of students and recent grads from Parsons, NYU-ITP and Cooper Union studying art, engineering, environmental science, and design," said the Windchimes team. "This competition was a great way to do meaningful work across disciplines that could have a direct impact on the quality of life in NYC and build toward a sustainable future. 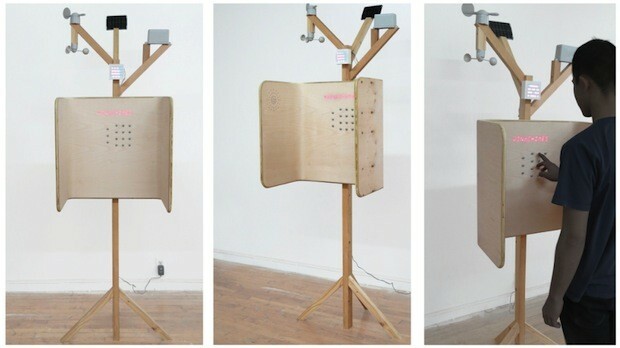 With Windchimes, we imagined adapting payphones to create a distributed environmental sensor network in service of New York City residents and visitors. The City's Reinvent Payphones Design Challenge allowed us to build a team around this vision and share it with the rest of the community." "The Reinvent Payphones Design Challenge was an opportunity to reimagine a piece of outdated city infrastructure in the age of mobile," said the Smart Sidewalks team. "In Smart Sidewalks we considered the widest range of issues the payphone might address from the changing climate to lowering the digital divide." In 1999, the City's Department of Information Technology and Telecommunications entered into a number of franchise contracts for the installation, maintenance and operation of public payphones on City sidewalks. These agreements expire on October 15, 2014. The next step in determining the future of the New York City payphone is the issuance of a Request for Proposals, which will be informed by Reinvent Payphone Design Challenge winners, public feedback received through the City's Request for Information issued last summer and ongoing pilot programs – including digital advertising on phone kiosks around Times Square, interactive touchscreens around Union Square and free public Wi-Fi at payphone locations across the city. The proposed pod contains WiFi to make NYC wireless, a crime alert system to make the city a safer place, bike share to promote green transportation and augmented reality compatibility to view the virtual world. Look Up! (New School) The prototype uses the payphone spaces to create mini-parks where people can collect themselves and take in the city skyline or, more practically, look up information to connect them to the people and places of New York. NYfi (Sage and Coombe Architects) Reinventing the payphone is not only about a sleeker design or a digital display. It is about radically reimagining a public amenity: how it will be used and what it will provide. 5/2: Five Boroughs, Two Ways to Talk (Rhode Island School of Design) The 5/2 is a solar-powered public charging station and pay phone. The 5/2 provides cell phone and pay phone users with dependable means of communication. NYC LOOP (FXFOWLE Architects) The NYC Loop serves as an access point to the latest technology while simultaneously supporting the public spaces that make NYC a unique place in which to live, visit and do business. Smart Sidewalks: Thinfrastructure for the 21st Century (various: Parsons, Syracuse University, UC Davis, Cheng+Synder, Rama Chorpash Design LLC) This proposal is driven by two competing aims: the desire to pack as much function into a single device as possible and the opposite urge: to reduce the literal and figurative footprint of the phone. MANNY, Metropolitan Application Network of New York (New School) MANNY (Metropolitan Application Network of New York) is a reliable and ubiquitous information system that improves city life through applications such as basic voice communication, video communication, social media, maps, transit information, community relevant data and safety services. NYC The Official Experience (Virginia Tech) New York City is a living, breathing museum of urban life. Its endless, ever-changing array of exhibitions span five boroughs and are on display in neighborhoods as varied as Red Hook and the Upper East Side. NYC I/O: The Responsive City (Control Group) Control Group and Titan have partnered to create NYC I/O. It is the transformation of the corner payphone into a digital node operating on a fiber network that will usher in a new era of the Responsive City. Beacon (frog design) Beacon is New York City's next generation communication and information hub. Its integrated technology includes LED matrix screens, sensors, speakers, lighting and solar cells. Windchimes (various/NYU) Windchimes are internet-connected environmental sensor stations that talk through payphones. They collect nearby data about weather, air quality and noise levels and make it all open and accessible to anyone from experts to children. A sixth prize category, Popular Choice, will be decided by the public vote through the City of New York's Facebook Page at HYPERLINK "http://www.facebook.com/nycgov" facebook.com/nycgov. Voting runs until March 14 and will be announced on March 15.